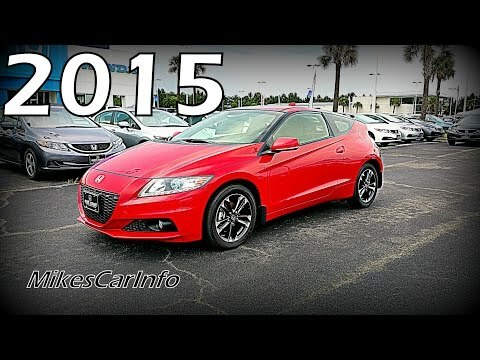 Honda's 2015 CR-Z hybrid is more than just another salvo in the green-car revolution. It's a true 2-seat sports car disguised as a fuel-efficient commuter. With razor-sharp styling and a comfy cockpit, the CR-Z shuns the Toyota Prius' conservative formula, even going so far as to offer a 6-speed manual transmission, the only compact hybrid to do so. Unique, sporty yet very affordable. Had issues with battery but they were covered with warranty. I love almost everything about this car. People regularly stop me and ask about my car. I love this car in almost every way. . . Awesome design/look, the paint color is a fabulous one that looks black at times but a sparkly eggplant in the sun, great gas mileage, fun and easy to drive, hybrid, etc. The only things I would change would be: 1. Reduce blind spots when manually turned around to look backwards when backing up, and 2. Incorporate defroster/wiper on the entire back window, as there is a little piece where they do not reach. My vehicle is a gas saver. It is a hybrid so it is great on gas. It is a sporty car with 3 different features. I can even put it in stick shift mode and control it from the steering wheel. It also has a back up camera in the rear view mirror! I would highly suggest buying this vehicle as it is perfect for traveling. Love the Honda CR-V - probably will be the only car I own. Love this car. I had the 2007 Honda CR-V and drove it until 2016 when I bought the new 2015. I bought the exact same model and color (white). The car is dependable, has great features and very comfortable to drive = also really good gas mileage I get compliments all the time. I did buy it loaded.